The walk starts from the Burke Centre Town Center parking lot at Burke Centre Parkway and Burke Commons Road. Park as far east in the shopping center as possible as the walk starts from that point. Burke Commons Road becomes Pond Spice Lane on the south side of Burke Centre Parkway. The walk starts on the asphalt trail on the east side of the Burke Centre Town Center next to the entrance road. The trail follows the entrance road away from Burke Centre Parkway and then curves to the right to go down a stairway into the woods. At the bottom of the hill keep to the left at the path intersections so that the stream remains on your right. The trail ends at an intersecting trail. Turn right to cross the bridge over the stream. Then turn left to continue following the stream with the stream on your left and homes on your right. Continue straight at the tot lot where there are trails to both left and right. The stream should remain on your left. At the next tot lot the trail bends to the left around the tot lot and continues to follow the stream. At the next trail intersection the trail changes from asphalt to gravel. Continue straight following the stream on the left. After the next trail intersection on the right the trail curves to the right around the homes and away from the stream. It then heads in the opposite direction on the other side of the homes. The trail goes down a flight of steps and intersects with Walnut Wood Court. Cross that street and take the asphalt trail on the other side. The trail leads to a bridge crossing a stream. A trail intersects just past the next tot lot. Turn left and follow the asphalt trail to the end of the asphalt section. A gravel trail intersects on the right. Turn right to follow the gravel trail. The gravel trail climbs a hill and splits. Take the trail to the left up the hill to Wooden Hawk Lane. Cross Wooden Hawk Lane and turn right to follow the sidewalk to Wards Grove Circle. Turn left to follow the sidewalk along Wards Grove Circle. Turn left onto the asphalt path between the houses just after 10020 Wards Grove Circle. At the bottom of the hill turn left onto the intersecting asphalt trail. The trail turns to the right and starts to head in the opposite direction. Turn left at the intersecting trail. After a short distance turn left again onto the intersecting trail. The trail follows a stream on the left. Do not turn at the next trail intersection where a bridge crosses the stream. A gravel path intersects from the left. Continue on the asphalt trail. A short distance later it turns right and goes up the hill to Wood Duck Court. 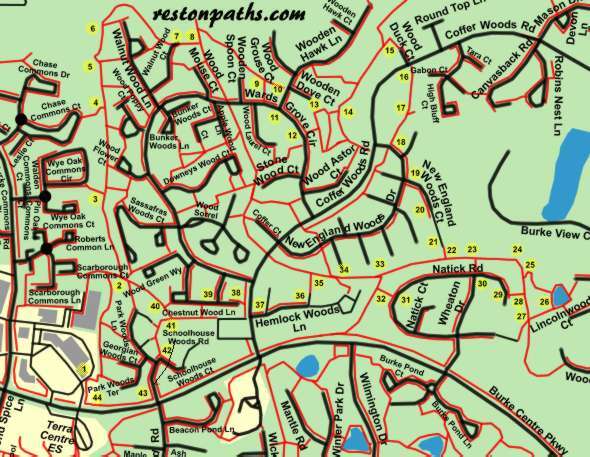 Cross Coffer Woods Road and take the asphalt trail directly opposite Wood Duck Court. A trail intersects to the left. Continue straight along the present trail. The trail intersects with New England Woods Drive. Turn left and follow the sidewalk along that road. After walking 2 short blocks turn left and follow the sidewalk along New England Woods Court. The sidewalk ends. Continue along the street for a short distance until the street ends. Take the asphalt trail at the end of the street. At the intersecting trail turn left. The trail crosses a bridge a short distance away. A trail intersects from between the houses on the right. Continue straight on the present trail. The trail curves to the right just prior to a basketball court. Turn left onto the gravel trail after the basketball court. Turn right to follow the trail along the pond dam. At the end of the pond turn right to follow the intersecting asphalt trail back into the woods. The next trail intersection is marked by rocks. Turn right. The next trail intersection is also marked by rocks. Turn left and walk up the hill between the houses. At the top of the hill cross Nadick Road and turn right to follow the sidewalk along that road. At the intersection with Wheaton Drive the sidewalk shifts to the other side of Nadick Road. Continue along the sidewalk on the right side of that road. The road curves to the left. After passing 9848 Nadick Road turn right onto the asphalt trail between the homes. Turn right onto the intersecting asphalt trail behind the homes. After a short distance the trail ends at an intersecting trail. Turn left to follow that trail along a stream. A trail intersects and crosses a bridge to the left. Continue on the present trail. Another trail intersects and crosses a bridge to the left. Turn left to follow this trail between the homes. Continue along a short section of road until a sidewalk appears on the right. Turn right to follow the sidewalk along Hemlock Woods Lane. At the intersection with Coffer Woods Road take the crosswalk to the other side and turn right to follow the gravel trail along that road. After a short distance a dead end street (Chestnut Wood Lane) appears on the left. The street does not connect to Coffer Woods Road. Turn left to follow a flagstone pathway to the sidewalk on the right side of that road. The sidewalk on the right side of Chestnut Wood Lane ends after a short distance. Cross the street to continue on the sidewalk on the left side. Take the sidewalk on the left side of Chestnut Wood Lane to the end of that road. At the end of the road take the short asphalt trail to the intersecting trail. Turn left and cross a bridge after a short distance. After crossing the bridge turn right at the next trail intersection and cross another bridge. The trail turns left and goes up a hill between fences. Continue to follow the fence on the left up the hill until the asphalt trail leads into a concrete sidewalk at the end of Schoolhouse Woods Road. Stay on the sidewalk along Schoolhouse Woods Road after crossing Park Woods Lane. At the intersection with Burke Centre Parkway turn right and follow the asphalt trail along that road. After a block Terra Centre School appears on the left and the entrance to the Burke Centre Town Center on the right. The rabbit shown was spotted next to the shopping center access road. This concludes the walk.